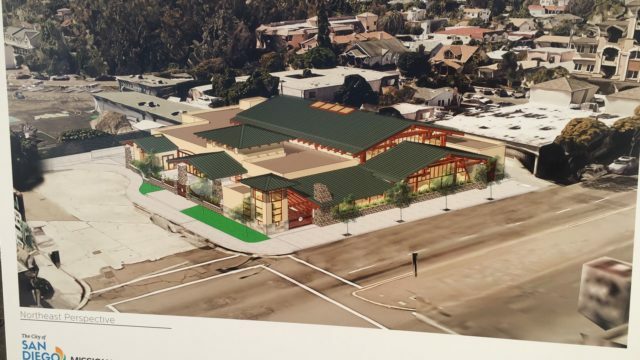 An architectural rendering of the new Mission Hills-Hillcrest Harley and Bessie Knox Branch Library designed by San Diego based Architects Mosher Drew. Image courtesy City of San Diego. 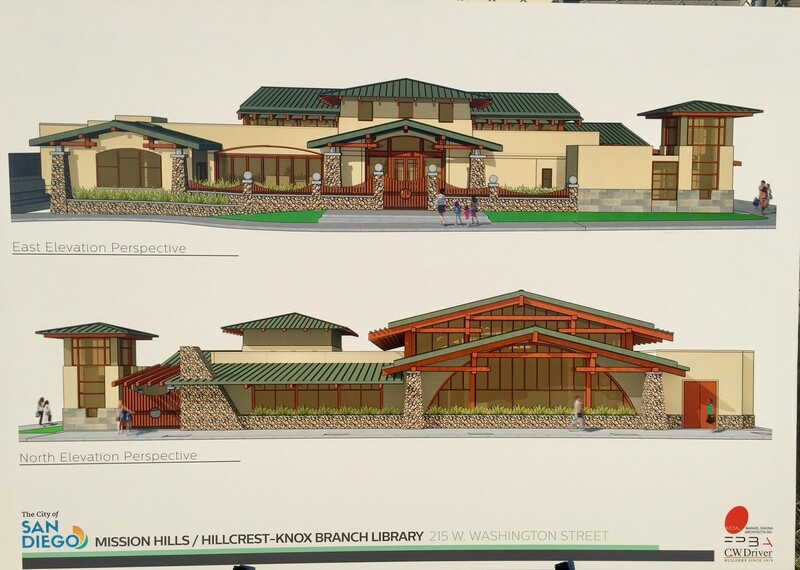 Construction of the new Mission Hills-Hillcrest public library, to be known as the Mission Hills-Hillcrest Harley and Bessie Knox Branch Library, kicked off Tuesday with an introduction to the project from officials and community leaders. The new library facility will be built at the site of the old IBEW building located on the corner of West Washington and Front Streets. The City of San Diego purchased this building in 2004 and it is scheduled to be demolished in April to make way for the new facility, according to a news release from the office of San Diego City Councilmember Todd Gloria. The total project cost is estimated at $20 million with $10 million in private donations, according to Gloria’s office. The new library facility is set to be a single-story, LEED Gold structure spaced at over 14,350 square feet, a 10,000 square foot increase compared to the old library branch. It will feature children and teen areas, study space, a computer lab, a community meeting room, and a Friend’s of the Library room, according to the news release. The new library project will also include a two-story underground parking garage with 85 parking spaces, which is 76 more spaces that the previous facility. Off-site improvements such as drought tolerant landscape and the forming of a cul-de-sac at the south end of Front Street are also included as part of the project, the news release stated. 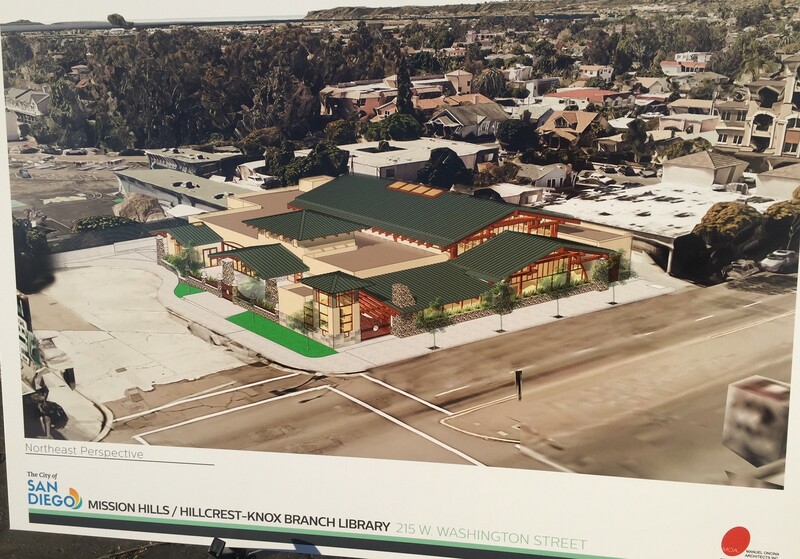 The attached architectural rendering of the new Mission Hills-Hillcrest Harley and Bessie Knox Branch Library has been designed by San Diego-based Architects Mosher Drew. A formal groundbreaking has been tentatively set for spring of next year. Originally opened in 1961, the old Mission Hills Branch Library currently sits at 3,850 square feet with nine parking spaces. 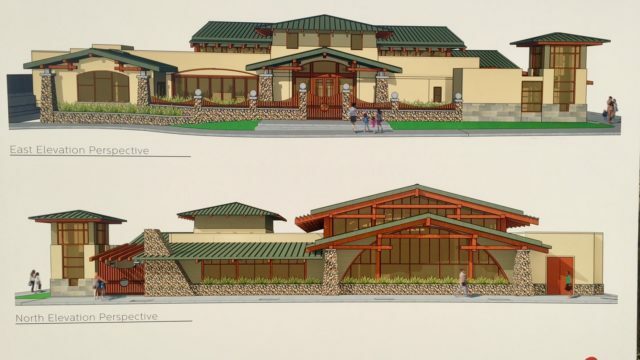 The old Mission Hills Branch Library will remain operational until the new library opens, according to the news release, and city staff is still looking to determine a future use for the old facility.